Welcome to the new "The Symposium Series on Hybrid RANS-LES Methods" website. Hybrid modelling methods of turbulent flows, combin-ing RANS and LES techniques, have received increasing attention over the past decade to fill up the gap between (U)RANS and LES computations in aerodynamic appli-cations at industrially relevant Reynolds numbers. The present Symposium addresses the most recent and new development on advanced URANS, DES and other hybrid RANS-LES techniques, which covers both the fundamentals of modelling approaches and their appli-cations to industrial flow problems. As with the First Symposium (Stockholm, 2005) and the Second (Corfu, 2007), the aim of the Third Symposium is to continue with the provision of a forum for research-ers and industrial engineers to exchange knowledge and expertise, to discuss and to present recent achievements in the development and applications of hybrid RANS-LES methods - including physical models and related numerical issues. Hence, this Symposium will encourage an emergence of new ideas and inspire participants to pursue and intensify efforts towards future developments and applications of hybrid RANS-LES methods. The Symposium has its focus on flow physics model-ling and related aerodynamic applications, particu-larly, in terms of advanced URANS, improved DES and hybrid RANS-LES approaches in general. 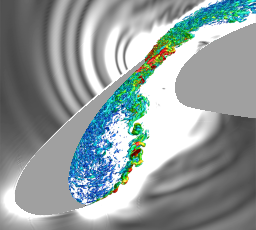 The Symposium is open to academic researchers, graduate students, industrial engineers, industrial R&D managers and consultants with an active in-terest in the fields of turbulent-flow modelling, simu-lations and measurements and multidisciplinary CFD applications, such as flow control, aero-acoustics, aerodynamic optimization and aero-elasticity.